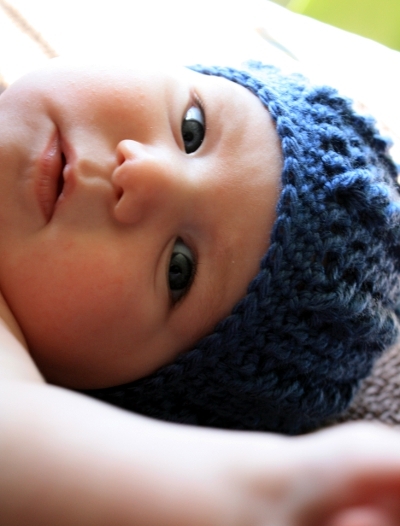 I created this pattern because I like to make hats for my friends’ new babies. I wanted a hat that would require a short amount of time from start to finish, but still have a “big” visual impact. 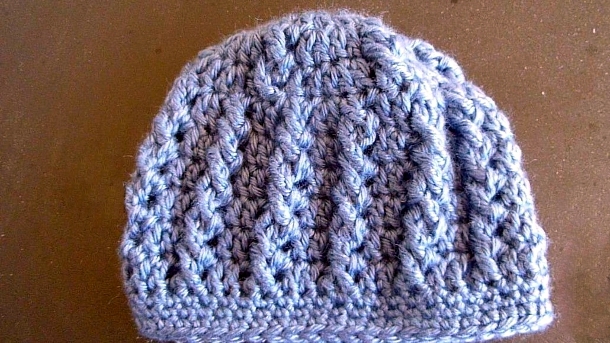 This stylish hat can be finished in less than an hour. Rnds 11-13: Ch 1; sc in same st and each around, sl st into beginning chain to join. 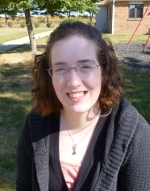 Julia Schwartz is the wife of a seminary student, a mother of a two year old daughter, and a daughter of a long line of crafters. She has been sewing since she was five, cross stitching since she was ten, and picked up crocheting and knitting in college. She also enjoys cooking, card making, and painting, but her true love will always be crocheting. She especially loves taking old patterns and making them contemporary. Pattern & images © Julia Schwartz. All rights reserved. I am having some trouble on Round 3. When I finish the instructions I have 30 stitches, but have 4 stitches left until the end of the round. I had 24 at the end of Round 2. Hope you can help, I have a nephew due any day now that I would love to make this hat for. Will someone please tell me all the corrections? I can’t figure it out. I am having trouble as well, but I have trouble on round 5… I am having a similar issue to Jen’s issue, but I am also wondering if the tr stitches are supposed to match up to round 4’s tr stitches? if so, mine were not… ? Hope you can help! I am running into trouble at round five as well. All of my previous rounds have the correct amount of stitches, but when I follow the pattern for round five I end up with a four stitch gap when I am supposed to join the round. Any help would be appreciated. The stitch count on round 5 should be 48. It should be 48 stitches through the rest of the pattern. Such a cute and simple hat. Thanks for sharing!! I love the pattern,simple and cute. I made one for my co-worker with pound of love. I know i will be making a few more in different colour. I made one for my co-worker who is expecting her first baby. I liked it so much, that I made one for myself by increasing the beginning dc by 6. Thank you. This is just wonderful for a baby boy! I would love if you would link this up to my new link party for the fiber arts! I LOVE LOVE LOVE this pattern!!! I cannot wait for my child to be able to wear this!!! It’s super cute!!! Thank you SO MUCH!!!! This hat is beautiful and I love that you have it in more that one size! I can’t wait to make this. How do you think you’d make this for a 2-4 year old? Hello, I would also like to know how to increase for a 3-5 year old..I made one using a J hook but I don’t know if it is going to fit my 4 1/2 year old granddaughter. It is 8.5 across and 8 inches tall. DC in each of next 2 stitches, Sk 1, TR in next, go back and TR in Sk’d St, THEN join with Sl St. I think if you add this, it works. thanks again for the post, I’m making several of these, for friends’ babies, and I’ll make a few for the little one I’m expecting. 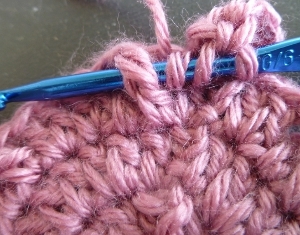 You can add a couple more stitches in the first round, then increase accordingly thoughout the rest of the pattern. I have found that adding 1 stitch in the beginning adds one inch in circumference. thank you for sharing this lovely pattern. I made it for my 4 month old niece and now my daughters want one as well. I spent some time trying to adjust the pattern for an adult and could not as the stitch combinations are more complicated than many other hats. Any chance you have worked up the pattern for an adult??? I would love it if you have done so. Julia, I absolutely love your pattern & have made many hats for my granddaughter and friends babies. Is it possible to make this for toddlers, children & even adults? I made one with a J hook for my 18 mo. Granddaughter but how would I make larger ones. Could you let me know if I need to change the initial number of chains, and the number of increases and so on? Thanks for any help you can provide. This pattern is a huge hit!! I love your pattern! Started and got through round 8 but realized my gauge was way to small. A bigger hook would not have looked as good with the yarn I am using so I added two rounds and three stitches after round 5. Then added cables between each established cable and continued on in this way. Thanks for posting! OH such a CUTE PATTERN! I can’t believe it’s FREE! *THANK YOU! * for sharing with us!!!!! Just made one fairly quickly~I think it’s my new favorite! Thanks for the great pattern! It works up quickly into a darling hat that is good for either a boy or a girl.